We are stoked to announce we will be adding a 22? halfpipe to our terrain park this summer along with a 2nd airbag that will be inlayed into the pipe. See image above where we have added the pipe and airbag in its planned location. The 22′ superpipe will be a two-hit pipe, ideal for training and feeding the next generation of Olympians. 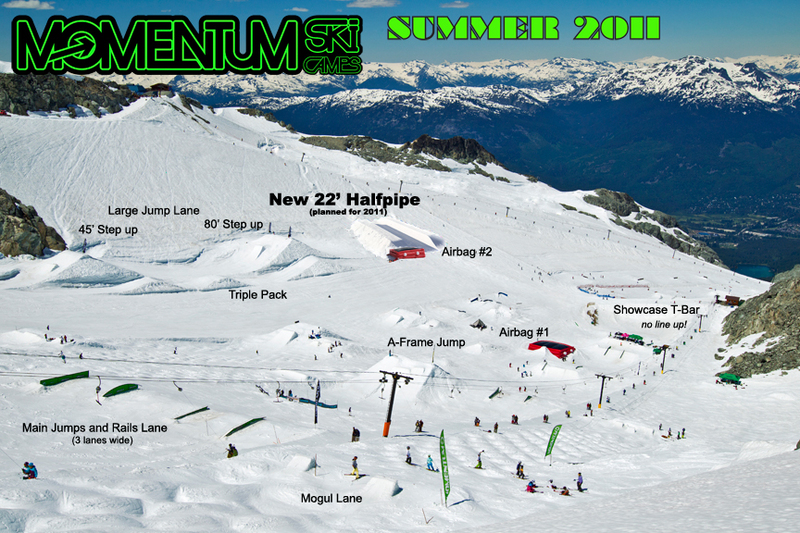 The pipe will be cut by Whistler’s newly acquired 22′ global pipe cutter and will be exclusively available to Momentum Ski Camps only. There will also be a 50′ by 50′ air bag at the end of the pipe to provide the safest learning progression, and as always, the Canadian Halfpipe Ski Team (Justin Dorey, Mike Riddle, Sarah Burke, Roz G and Trennon Paynter) will be using the pipe for training and teaching at Momentum. This season has been the 2nd Snowiest Winter on record at Whistler Blackcomb – our mid mountain base is still over 10 feet! This means only good things for our new park design. Chris Turpin, terrain park Manager and designer along with the newly appointed Momentum Dig Crew are getting amped with plans for 2011. The legendary 80’ Step-Up, Voted Best Jump on the Glacier, will be back. The 32? Wall Ride is back. Add in 2 Airbags, the Water Ramps, a Foam Pit and More Trampolines than ever before, and the learning curve just gets easier! Momentum’s Coaching Roster has always been their greatest strength and this year is no exception. FREERIDE COACHES : New to the team, this years X-Games Gold and World Champion ALEX SCHLOPY along with veteran and Multi X-Games Champions, SIMON DUMONT and KAYA TURSKI. Former campers, DAVE CRIGHTON and this year Euro-X Slopestyle Medallist JAMES (WOODSY) WOODS is also on board for this summer. Our returning Momentum Rock Stars include, Sarah Burk, Justin Dorey, Mike Riddle, Roz G, Paul Bergeron, JF Houle, Alexis Godbout, AJ Kempainen, Kristi Leskinin, Colby West, Rory Bushfield, Josh Bibby, Tanner Rainville, Tim Russell, Ian Cosco, Trennon Paynter, Corey Vanular & TJ Schiller (injury dependant). MOGUL COACHES : New to the team this summer is the Rookie sensation MIKAEL KINGSBURY , 18 Year old Mik stepped up on the podium 8 times this season! He finished 3rd Overall on the World Cup Grand Prix and captured a Silver and Bronze medal at the 2011 World Championships! Returning Roster of Momentum Coaches include Olympic Gold Medallist, Alex Bilodeau along with Kristi Richards, Phil Marquis, Chris Wong, Eddie Hicks, Shelley Robertson, Scott Bellavance, Chelsea Henitiuk, Jamie Tanner, Tami Bradley, Warren Tanner, Ryan Johnson, Andrew Clough and Momentum’s Chief John Smart. July 1- 9 will be our Special Girl Week, which runs alongside our regular camp, but offers extra activities and mentoring for our girl skiers. Special attention and extra activities include ladies only afternoon photo & film sessions on – hill, trampoline sessions, all girl spa trip, movie night, beach days and sponsor prizes for ladies only. This years line up of Girl Power Coaches could not be better, we have every current 2011 X-Game or World Champion you can ask for! Starting with our Freeride team leaders Sarah Burke (X-Games Gold Half-Pipe), Roz G (World Champs Gold Half-Pipe) & Kaya Turski (X-Games Gold Slopestyle). Kristi Leskinen, Meg Gunning, and Dania Assaly will also be on hand to make sure this week is Epic for all. We also expect to have Kristi Richards and Chelsea Henitiuk back for moguls. Kristi has won multiple World Cup medals, is a former World Champion and won bronze at this year’s Worlds and Chelsea is dominating the NorAm tour. We hooked up with Sarah Burke during the WSI and asked about her year along with plans for this summers Girls Week, check out the interview HERE. Congratulations to Mark Hendrickson from Alberta who won the FREE ALL-INCLUSIVE CAMP in our Colby West Contest. Also props to runners up Gavin Rudy from Colorado and Samuel Holinaty from BC for their great videos. Check out the winning video HERE. Patrick Hughes scooped the $2000+ gear prize in the TJ Schiller 1620 Contest and will be receiving; a Sign Pair of Tj’s Skis, GoPro, Skullcandy pack, Nike golf bag, Momentum Swag pack and a number of other goodies at camp!